My blackened chicken recipe is worth it's weight in gold. There really is nothing hard at all to prepare this dish. I enjoy this; it's a great change of pace from plain chicken. You adjust the seasonings to how "hot" or mild you want it. You will find more easy chicken recipes at the end of the page. It's delicious when cooked on the grill too. Take the chicken out of the refrigerator 30 minutes before cooking (this brings the chicken closer to room temp and the chicken will cook faster). Mix the 8 seasonings together (not the Cajun seasoning) and place in a resealable bag. Heat a cast iron pan on high for 5-10 minutes until smoking hot. Meanwhile, spray the chicken directly with vegetable or canola oil and place in the seasoning bag and shake until coated. Place the chicken in the pan and lower the temperature to medium-high; letting it cook for 5-7 minutes (you will see the sides of the breast turn white). Spray the uncooked side with vegetable or canola oil and again sprinkle with the remaining Cajun seasoning; flipping it over. Cook another 5-7 minutes. Take it out of the pan and let it sit for 10 minutes. Take out of the refrigerator for 30 minutes before you cook it. Heat pan till it's smoking hot, to help cook chicken faster and allowing it to sear and seal in juices. Let chicken sit 10 minutes after it is out of the pan for the juices to flow throughout the chicken. If you cut it too early only the first bite will be juicy the rest will be dry, and you don't want that. 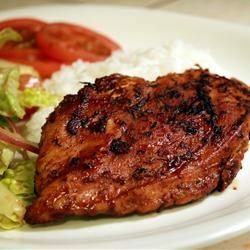 I really enjoy this easy blackened chicken. I think it is really good with loaded mashed potatoes or potato wedges with homemade ranch dressing. What do you like to serve with this? Tell us below.